A reliable marine battery is essential for starting and powering your boat’s engines. 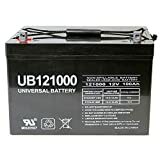 Batteries come in a variety of types and sizes, from starter batteries specifically designed to crank and start an engine to deep cycle batteries designed for use with trolling motors and appliances. In the guide below, we’ve listed five marine batteries that outperform the competition. Many of the batteries we’ve listed are dual purpose batteries, designed to both crank an engine and for use as a deep cycle power source for appliances, trolling motors and electrical equipment. All of our recommendations include information on each battery’s cranking power and reserve capacity. We’ve also included detailed reviews of each battery that go into more detail about its specific strengths, weaknesses and unique features. Before we get into our top marine battery recommendations, let’s cover the key factors that you should look for in a reliable, effective marine battery. Starting batteries are designed specifically to start inboard and outboard motors. These batteries are usually capable of delivering a large amount of cold cranking amps (CCA) or marine crank amps to crank an engine and allow it to start operating.Because starting batteries are designed solely to start an engine, you’ll need a separate deep cycle battery to power any 12v appliances and trolling motors once your inboard or outboard motor is turned off. Deep cycle batteries are designed solely to provide a consistent source of power for 12v electrical appliances and items like trolling motors. Instead of delivering a sudden burst of energy, deep cycle batteries are designed to deliver a steady electrical flow until their charge is completely used up.Just like starting batteries can’t deep cycle, deep cycle batteries are not designed to start an engine. This means you’ll also need a starting battery to crank your boat’s motors. Dual purpose batteries are designed to offer the best of both worlds. These batteries deliver a large amount of starting power, while also offering a sizable enough reserve capacity to power trolling motors and other electrical appliances.Normally, dual purpose batteries offer good performance as both starting batteries and deep cycle batteries, but don’t perform as well as a dedicated, single-purpose battery at either task. Each type of battery has its set of advantages and disadvantages. If you only need to start up your boat’s engines and don’t need a continuous source of 12v electricity, you’ll only need a starting battery. If you need to deep cycle, you’ll need a dual purpose or deep cycle battery. Cold cranking amps (shortened to CCA) is a measure of a battery’s starting power. As a metric, it measures some amps a battery can deliver in 30 seconds at a temperature of 0°F. A battery with a large CCA rating is powerful and capable of starting almost any normal engine. In addition to CCA, some batteries are rated in marine cranking amps (MCA). This is a measure of a battery’s starting power at 32*F.
There’s no “perfect” CCA rating for a battery. However, it’s always important to choose a battery that exceeds the recommended starting power for your engine. Most batteries with a CCA rating of 700 or more can comfortably start almost any small to a mid-sized outboard motor. A battery’s reserve capacity is the amount of time required for a fully charged marine battery to drop below 10.5 volts while discharging 25 amps. Like CCA, reserve capacity is often shortened to RC and is measured at the exact temperature of 80°F. The higher a battery’s reserve capacity, the longer it’s capable of performing. If you have large electrical demands and need to power a lot of equipment, it’s important to choose a battery with a large enough reserve capacity to match or exceed your needs. Older lead acid batteries require maintenance, making them a nuisance to own. New batteries that use AGM (absorbent glass mat) technology require zero maintenance, making them much easier to own and use. AGM batteries also tend to be leak proof, making them safe to mount in positions that damage conventional batteries. Some high-end batteries are even designed with a watertight seal that allows the batteries to continue operating even if splashed with water. Over time, batteries gradually begin to lose their effectiveness and stop being able to maintain a charge as effectively as they once could. Even if it’s completely new and unused, a battery that’s one year old won’t perform as well as one that was just delivered from the factory. To get the best possible performance from your battery, it’s important to check its manufacturing date. Batteries that are less than six months old will offer good performance, with little or no loss of starting power or reserve capacity. The Optima Batteries 8016-103 D34M BlueTop is a versatile battery that can be used for both starting and deep cycling. With a 120-minute reserve capacity and 750 CCA, this is a reliable battery that offers good performance and a large enough capacity for practical use. Rated at 750 cold cranking amps, this battery is a good starter battery for boats, RVs, and mechanical equipment. Designed to perform well in cold weather and stressful situations, with an exterior that can withstand up to 15 times as much vibration as similar batteries from other brands. The 8016-103 D34M BlueTop has a 120-minute reserve capacity, giving it a sufficient amount of reserve storage for use with a trolling motor. Compared to batteries with a similar capacity and starting power, the 8016-103 D34M BlueTop is fairly light and compact, with a design that makes it easy to mount in your boat or RV. Optima sells the 8016-103 D34M BlueTop with a two-year warranty, meaning you can return it for a free replacement within the first two years after purchasing in the event it has defects that prevent it from operating properly. The Optima Batteries 8016-103 D34M BlueTop is a good quality battery that can be used for starting and deep cycling. If you need an all-purpose battery for your boat or RV, this is one of the best dual purpose options on the market. With 750 cold cranking amps, the 8016-103 D34M BlueTop is more than powerful enough to start a boat engine. It also has a reserve capacity of 120 minutes under normal use (25 amps discharge in temperatures of 80°F), making it great for use with a trolling motor or RV. It also has other useful design features, such as a vibration resistant design that prevent the battery from becoming damaged due to engine vibration. It’s light and easy to mount in almost any location within your boat or RV. Because the 8016-103 D34M BlueTop uses absorbent glass mat (AGM) technology, it’s possible to damage the battery through overcharging. This is a relatively minor risk and will only appear if the battery is charged incorrectly. The Optima Batteries 8016-103 D34M BlueTop is an excellent dual purpose battery for use on your boat or in your RV. Sleekly designed and competitively priced, this is a high-quality battery that offers good value for money at its retail price. Designed as both a starter and deep cycle battery, the Exide XMC-31 MegaCycle AGM-200 offers excellent performance, with a 200-minute reserve capacity and impressive power rates of 925 CCA at 0°F and 1,110 CA at 32°F. Designed to charge quickly and retain more power than similar batteries in its class and price range. Strong exterior housing keeps this battery safe and protected, with excellent resistance to vibration and wear. Uses AGM technology to prevent the battery from drying out as it’s used. Lasts for 200 minutes of normal use (25 amp continuous draw at a temperature of 80°F), putting it near the top of its category regarding power reserve. Comes with an excellent 24-month warranty, allowing you to return the battery and get a free replacement if it stops working within 24 months of the date of purchase. The XMC-31 AGM-200 is a great battery that can start and deep cycle. It has a reserve power capacity of 200 minutes, giving you more than three hours of regular use with a trolling motor in optimal conditions. It’s also quick and easy to recharge, provided you have a good charger. This battery has several unique features that make it stand out. The first is its design, which is engineered to prevent vibration from wearing out the battery. Exide uses AGM technology in this battery, which prevents it from drying out with use or because of excessive vibration. Another huge advantage of this battery is its warranty. With a 24-month replacement warranty, the XMC-31 AGM-200 is easy to replace if it fails. Send it back to Exile to get a free replacement battery — a guarantee that’s hard to find from competitors. No battery is perfect, and for all of its strengths, the XMC-31 AGM-200 does have a few small weaknesses. First, it’s quite an expensive battery, with a slightly higher retail price than other batteries in the same power reserve and performance range. Secondly, there are some reported cases of customers receiving batteries that are two to six months old, often with a reduced power capacity. Although it’s easy to return the battery for a free replacement if you receive an old model, this is still a slight inconvenience. 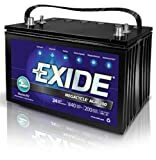 All in all, the Exide XMC-31 MegaCycle AGM-200 is a versatile battery that performs well for starting and as a deep cycle battery for use with a trolling motor. If you’re looking for a great battery that will perform well for several years of use, it’s one of the best choices available. The Optima Batteries 8052-161 D31M BlueTop is a dual purpose battery that delivers excellent starting power and 155 minutes of reserve capacity for deep cycling. Thanks to its performance, this is a great all-purpose battery for boats and RVs that need plenty of power. 900 cold cranking amps and 1125 A marine cranking amps make this a powerful battery that’s ideal for starting outboard motors and other demanding equipment. This battery has a 155-minute reserve capacity at 80°F and 25 amps, giving it plenty of power for deep cycling and powering trolling motors. Optima have fitted this battery with a very thick, solid and durable plastic exterior that’s 15 times as resistant to damage from vibrations as other batteries in its class. This battery charges quickly and can tolerate three times as many recharge as similar batteries from other manufacturers, making it a great long-term buy. Optima backs up the 8052-161 D31M with a two-year warranty, with free replacement batteries available if any defects occur within 24 months of the date of purchase. The Optima Batteries 8052-161 D31M BlueTop is a versatile battery. It has more than enough power to start even the most demanding motors and accessories, with 900 cold cranking amps and 1125 A marine cranking amps. It’s also a useful battery for powering a trolling motor, with a 155-minute reserve capacity that’s ideal for equipment that requires a deep cycling battery. If you need a battery that can do almost anything, the 8052-161 D31M BlueTop is a good choice. One of this battery’s biggest advantages is its design. Thanks to its thick plastic case, it’s up to 15 times as resistant to damage from vibration as similar batteries in its class and price range — a useful feature if you plan to use it to start a powerful engine or mechanical equipment. Finally, it’s backed up by one of the best warranties available, with 24 months of coverage from the date of purchase. If your 8052-161 D31M stops working or run into a defect, you can return it for a free replacement from Optima through Amazon. At 59 pounds, the 8052-161 D31M BlueTop is a heavy battery. It’s also quite large, at more than 12 inches in length and 10 inches in height. Finally, like all AGM batteries, it should be charged carefully to avoid damage to the battery from overcharging. The 8052-161 D31M BlueTop is an excellent battery that delivers plenty of starting power and enough reserve capacity to make it useful for powering a trolling motor. If you’re looking for an excellent dual purpose battery, the 8052-161 D31M is one of the best choices available. 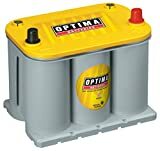 The Optima Batteries 8040-218 D35 YellowTop Dual Purpose Battery is a compact dual purpose battery designed for starting and deep cycling. With a starting power of 650 cold cranking amps and a 98-minute reserve capacity, this small battery packs a serious punch. With 650 cold cranking amps, this battery is powerful enough to start most small to mid-sized outboard motors, as well as cars and other mechanical equipment that’s designed for a group type 35 battery. This battery has a 98-minute reserve capacity, giving it sufficient power for use with a trolling motor or other equipment that requires deep cycling. Designed for durability, with a rugged plastic exterior that makes this battery 15 times as vibration resistant as similar products in its class and price range. Because of its lightness (it weighs under 40 pounds) and small form factor, this battery is a great option for small boats with limited storage space. Optima provides a 36-month warranty for this battery, with free replacements available if your battery experiences defects or stops working within the first 36 months of purchase. With its small form factor and limited weight, the Optima Batteries 8040-218 D35 YellowTop Dual Purpose Battery is a great choice for powering small to mid-sized outboard motors and electrical equipment that requires a steady, deep cycling power source. This is a dual purpose battery, meaning it can be used for starting and deep cycling. It delivers 650 cold cranking amps, which while not quite as much as larger type 34 or 31 batteries, is still more than enough to start smaller engines. It also has a reasonably long reserve capacity, offering 98 minutes of usage for trolling motors and other mechanical equipment. Add its small size into the equation, and this is a high-quality battery that’s perfectly suited to smaller boats. Optima usually provides a 24-month warranty for their batteries, which is already an excellent level of support. However, the 8040-218 D35 YellowTop has an even more impressive three-year warranty that covers it for 36 months from the date of purchase. Because this battery uses AGM technology, it can suffer damage if it’s charged improperly, and especially if overcharged. Make sure to read the operating manual before you charge it for the first time to avoid potentially damaging the battery. If you’re looking for a group type 35 battery that delivers consistent performance for starting and deep cycling, the Optima Batteries 8040-218 D35 YellowTop is hard to ignore. Thanks to its high-quality design and great warranty, this is a great battery sold at a very fair price. The Optima Batteries 8006-006 34M BlueTop is a powerful starting battery designed for use with marine engines, cars, and recreational vehicles. Thanks to its impressive starting power and high durability casing, this is an excellent battery for use on your boat. With 800 cold cranking amps and 1000 A marine cranking amps, this battery has serious starting power that makes it ideal for string marine outboard motors and car engines. This battery uses AGM technology, meaning it’s 100% maintenance free and requires no work between uses. Fitted with thick plastic casing, this battery is designed to perform well in any weather and tolerate any conditions. It’s up to 15 times as vibration resistant as other batteries from competing brands. Because it’s relatively compact and weighs less than 40 pounds, this battery is easy to mount anywhere in your boat. Optima offers a 24-month warranty for the 8006-006 34M BlueTop and will provide a free replacement if your battery is defective or non-working within the warranty period. The 8006-006 34M BlueTop is an excellent starting battery. It delivers 800 cold cranking amps and 1000 A marine cranking amps of power, letting it crank almost any engine and deliver good performance on even the coldest of days. Optima has designed this battery using AGM (absorbent glass mat) technology, which means it requires no maintenance. It charges in six to 12 hours and holds its charge very well, making it an extremely reliable buy for your boat, car or RV. This battery is very durable, making it a good choice for sports boats. It can tolerate 15 times as much vibration as similar batteries from other manufacturers, largely due to its thick casing and use of SpiralCell technology. Because this battery comes with a 24-month warranty, you’re protected for a full two years from the date of purchase. Optima is quick to respond to issues and provides free replacements for broken, damaged or defective batteries. If you’re looking for a powerful, reliable starter battery, the 8006-006 34M BlueTop is a fantastic choice. It delivers excellent performance and plenty of power, making it a great choice beside a second battery for deep cycling.